The handstand is not necessarily as advanced as you think. While it is a bit advanced, there are steps you can take to learn a handstand just like you would learn a loaded back squat or deadlift. A squat is a basic movement most people have done before. Picking something up and putting it down is something we all do every day whether we are grocery shopping, picking up a baby or doing chores. The reason the handstand is different than learning the progressions of a loaded back squat or deadlift is that we already pretty much know the latter movements. The handstand is similar however, wherein the skill is learned over time after completing various drills that develop the muscular adaptations. More than anything, a handstand takes a lot of muscle memory. Thus, you must first teach the muscles. Being strong overall is important but it is not a ticket to the show. You must apply your strength in ways you never have before. Some people may say there are a few differences between building the muscular adaptation with a loaded back squat, for example, and learning how to hold a handstand. There is only one difference: most people are not comfortable upside down and have never gone upside down. There are ten things you should do to learn how to hold a handstand. Before we get started– just know that I will first teach you how to go upside down using a wall. Once you learn how to be in a handstand position upside down, we will work on other drills while inverted and learn drills on the floor to improve the ability to hold a freestanding handstand. You may have never been upside down before so this first step sounds incredibly daunting. Don’t worry–in step number two, I will give you the beginner’s approach to going upside down. The way I see it, the first inversion is like the first time you jump into a cold pool of water. 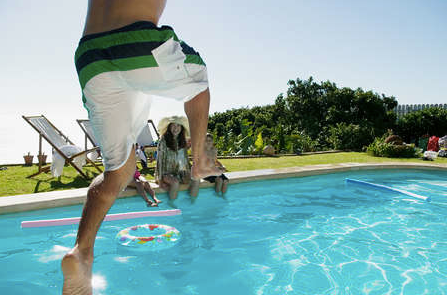 There is literally one way to do to it– you just gotta dive in. No matter what the water will be cold; in this case, no matter what, you WILL be upside down. Once you learn the spiderman approach, (see next step), it will be important to do this about three to five times a day, 10 seconds each, in the first week of handstand training. The wrists will have to warm up to this pressure; the shoulders will learn to bear your own weight; it will be weird to feel your legs over head. You can do this every day if you feel up to it– however in the first week do not go over 10 second long holds. Take at least one minute of rest between holds. 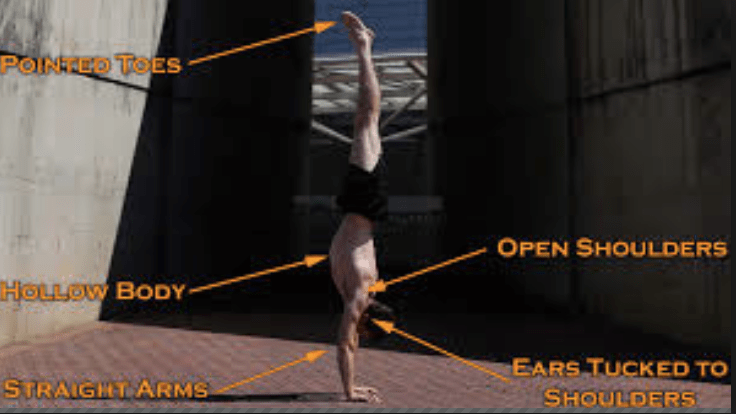 Later on in the article I will explain other drills you can add to the handstand holds after two weeks of pure upside down practice to stay on track and build strength for the handstand. If these holds feel good after the first week, try adding 5-10 seconds each new week. *Do NOT go over ten seconds on a hold, until you can do the hold with the NOSE and TOES touching the wall. See the next video. This is a technique to get the body upside down before you are ready to kick into it. Perfecting this drill is crucial because learning the tight hold position (nose and toes to the wall, glutes squeezed) will teach you how to get under yourself later on without the wall. Advanced learners who can already kick into a handstand against the wall may think they can skip this step. If you do *only* back against the wall handstands you will constantly practice leaning too much and kicking too hard. Even more, you will not learn how to stop yourself from walking forward or backward when the momentum from kicking into it becomes too powerful, or worse, lacks power. Later on in training you can add back to the wall handstand via kicking into it, but for now, we want to work on walking ourselves into a belly to the wall (or close as possible). You may notice it is incredibly tough to even get the belly to the wall at first. The key is to focus on finding a hollow hold position no matter what and squeezing your glutes like there is no tomorrow. 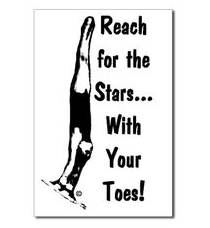 A trick to stay tight: keep the toes pointed! You may or may not need a spotter to get on the wall, that is okay. Once you are up in the best position you can attain, whether belly is to the wall yet or not, TUCK THE CHIN. Squeeze the glutes and push down through your shoulders with a focus on the finger tips. Hold for at least ten seconds. To get out of the handstand you can simply walk five hand steps forward, bend the knees and crawl down. For advanced learners we will learn the cartwheel out of the handstand. Then we will learn tuck and roll out of the handstand later on in the article. This technique is important for many reasons. First of all– if I am upside down, I have the potential to fall down any direction, correct? Very few of us are lucky enough to fall perfectly right back down onto our feet every time. A good way to learn how to get your toes over your head and simultaneously learn how to move laterally is to practice the “sideways approach” or the cartwheel approach. Why move laterally upside down? Because you have to know how to keep tight from falling and be strong in all directions so that later on you can move in all directions. This technique is where we begin to develop the ability to resist detracting powers on your handstand and to encourage movement while in the handstand– if you want to move without falling. You can get into a back to wall handstand two ways: a kick up or a cartwheel in. Once you feel confident in your belly to wall handstand you will work on kicking up to the wall, with your backside landing against it. The good news is, the wall will catch you. If you are nervous try practicing several kicks until you make it up there. How hard do you kick? The key is to not have your hands too close to the wall when you first attempt it. Begin by placing the hands about six inches from the wall. It may feel a bit scary but you will have to kick past twelve o’clock in order to slightly fall into the wall. Scared? Let me remind you, the wall is there. Once you can kick up to a handstand the good news is, you can hold it there and it is much easier to come down this way. After completing three weeks of belly to wall handstand holds (squeezing everything tight), start the fourth week by adding the back to the wall handstands. Each day do three sets of two handstands for twenty seconds back to the wall and two belly to the wall, for a total of two minutes upside down in week four. (See sample training schedule at the end of the article). You have to be strong overall to do a handstand but even more, you have to be strong in your handstand. You must learn to stay tight. This means squeezing everything to hold yourself up. Handstands don’t exactly happen in a relaxed position. Once you can back squat 200 pounds you don’t stop doing mobility work right? Same goes here. Thus, even when you can kick up to a handstand WITHOUT a wall and be 100% vertical, you should still be doing handstands holds. In the video above you can see me go from relaxed to tense; that is because I want you to see the difference in body position. I can actually be relaxed in a handstand similarly without the wall because am very good at standing on my hands. However, for most people with great handstands, the handstand takes place with a lot of tension in the body. We need to learn to hold that tight position with great tension first so the muscles can memorize the feeling and the position. To work on squeezing, once you have mastered the back to wall and front to wall handstand holds, you will start doing 30 second holds, both sides twice, while working on minimal contact efforts. Any time you are working on any handstand drill, you should be squeezing. On week four of handstand training, you want to work on learning to shift your weight to various parts of you finger tips as well as practicing to lift one leg off the wall at a time. You will be completing the same “hold” drills but begin to bring awareness to the fingers and legs because you will have more time to spend upside down. Refer to the diagram at the end of the article to incorporate these drills into your training program. Another drill that not only builds skill but helps work on fingertip balance is the press handstand drill. Press handstands are very advanced, but beginning press drills are not. Press handstand drills are a good way to practice balance before a complete inversion. Whether you do straddle ups, pike ups or L-holds, you learn to shift weight through your fingers. The key is to develop the skill of determining what the effect on the handstand is when putting pressure on different fingers or areas of the palm. This is the skill you must master in order to hold a handstand as long as you wish. Place your hands in front of you, your feet wide to start. You will work on just getting your shoulders past your fingers and focus intently on how the weight feels in the fingers. Do five rocks forward and then rest. *Note you can do this drill against a wall, just start with your hands one foot away from the wall. These are not listed in the training program because they are not absolutely necessary for beginners. Feel free to start them in week 5 if you wish. You want to be bold when you do this falling drill, staying as tight as possible. This is basically a fear drill. This is a way to learn what it feels like to fall. It demonstrates the importance of tucking the chin. It teaches you how to be broomstick because you stay extremely tight. In the same vein as practicing squeezing, here is a metaphor for squeezing: it would be much easier to balance a broomstick in your hands than a tall stick of jello or several stacked Jenga pieces, right? Essentially you want to become one solid unit. Becoming one tight piece or plane is what you seek. This is also a reason why you should tuck your chin–it is the most balanced position. Once you can do a handstand, it is fun to work on being a broomstick by having a partner push you. You SHOULD try and walk the hands to counter balance in the beginning stages of this partner drill, see below. This drill will help develop power in the shoulders. Another aspect of this drill is the pressure experienced by the wrists–there will be impact. However this drill forces the body to stay tight so it can actually hop in the air. The “hop” is also known in gymnastics as “blocking.” You want to block hard in a vault; the handstand is skill within vaulting. Just like you can work to develop power in the legs, power upside down can be learned— the difference is that the elbows stay locked and the power and push comes from the blocking of the shoulder. As your hands first tap the floor, you immediately imagine it is hot lava where you place them and hop forward. IMMEDIATELY. Simultaneously, the legs snap together when the hands hit the second stop on the floor. As you may have ascertained you will be spending a lot of time upside down and on your hands. The shoulders will be under more stress than they are accustomed to. While it is good to spend time upside down it is also necessary to rest. In conjunction with the handstand holds you can continue to improve by adding hollow holds. Like planks, these work the core while giving the shoulders a break. Technically we could list this drill first, but the article is designed to teach the handstand skill, not how to get a stronger core. The hollow hold drill itself is essential for understanding not only how to squeeze and stay tight, but how to compress the rib cage. Knowing how to do this will be key later when trying to fight holding a still handstand. I hope you enjoyed this article. Please feel free to reach out with any questions. For a copy of the training program PDF, email me at gwcrof@gmail.com. This is amazing! I’ve been looking for an article like this for so long! I’ve got a bit of experience with lifting and all the same techniques are here. Made it seem a little less overwhelming. Seems like a shoulder press or deadlift except upside-down. So glad that Jordan linked to you. Would you switch these progressions around for a guy who’s never done a cartwheel but can super easily do the hollow hold / straight rigid body / shoulder strength stuff? Thank you! I am glad this was helpful. In my opinion, the handstand is a skill, a very important skill. The cartwheel is a separate skill. While going upside down is a commonality, they are not necessarily as related in their beginning phases. I would argue it might be better to learn the handstand first. 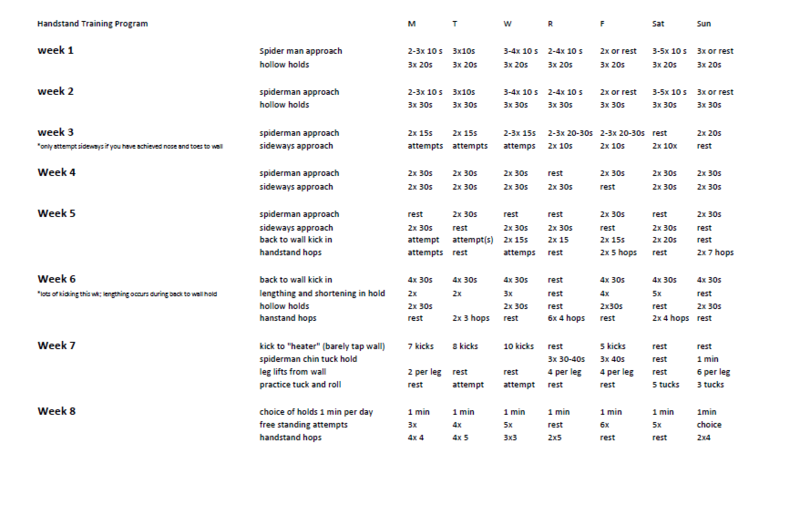 I think if you have some strength and trust that strength, these progressions are a perfect place to start. Go for it, and as always #daretomove!